Making Tax Digital, we’re ready! For some time Aqilla’s VAT 100 report has produced the information required to file quarterly VAT returns either on paper or online. 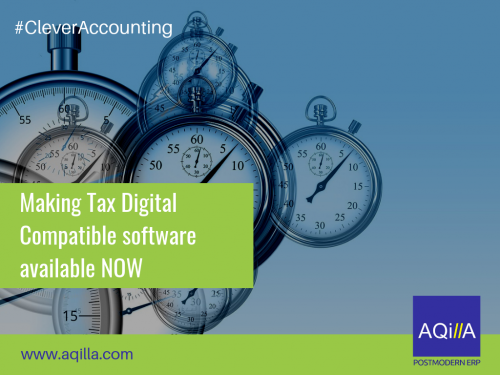 Now, in accordance with MTD requirements, Aqilla clients can automatically provide HMRC with an update of figures that are presented in this report and has officially been approved and subsequently added to the HMRC’s list of VAT compatible software. “Gone are the days of waiting months (if not years) to see a new product release, monolithic software development approaches don’t have the agility to support a mobile, disparate workforce. The “Making Tax Digital” initiative from HMRC reflects the continually changing approach organisations have to doing business”. Aqilla is described as a ‘postmodern ERP’ solution in recognition of the change in approach to software development. The company is committed to providing users with a platform that grows with their needs and delivers results in an intuitive and easy to use application and continue to extend the range of API’s and plugins to ensure easy integration into CRM, Business Intelligence, Excel and other backend systems. Visit www.aqilla.com for more details.